Spirit has been getting a workout trying to climb the most difficult terrain encountered so far by the two rovers that landed on Mars in 2004. 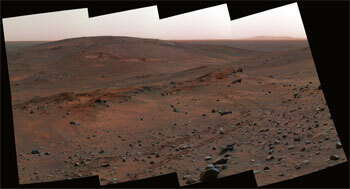 Like a hiker walking on loose scree, the rover's wheels began to slip near the top of the "Columbia Hills." This false-color rendering shows the scene acquired by NASA's Spirit rover on martian day, or sol, 454 (April 13, 2005), using its panoramic camera filters at 750-, 530-, and 430-nanometer wavelengths. In the background is "Clark Hill," nicknamed for one of the Columbia astronauts. Spirit is looking down at the outcrop on the left, nicknamed "Methuselah," from a slightly higher position, and will spend some time studying the outcrop before searching for a different route. Normally, a rocky slope tilted 12 degrees to 15 degrees would pose little difficulty. The rovers usually perform well on rocky terrain. In this case, however, the rocks were 25 to 30 centimeters (10 to 12 inches) tall and interspersed with loose sand. When a more direct ascent failed, rover drivers told Spirit to zigzag up the hill, much the way trailbuilders traverse from side to side to get up a slope. "Even though we weren't trying to drive directly up the slope, the wheels were digging in," said rover driver Chris Leger, at NASA's Jet Propulsion Laboratory. "We could see potato-size rocks that could get stuck in the wheels so we decided to look for another route." As the rover backed down the slope, scientists discovered an interesting rock outcrop and decided to stop and take a closer look. For now, Spirit is camped on more level terrain. Scientists nicknamed the outcrop "Methuselah." Eventually, they will seek an alternate approach to the top. "Our basic plan is to contour around to the west and southwest and see what we see," said Leger. "Older images show what looks like a ramp-shaped ledge leading up to the summit."